Updated 2016/09/18: Adding example files for use with older versions of SWAN. Updated 2016/07/31: Minor changes to the SWAN control file to be compatible with SWAN v41.10. Many new users of SWAN+ADCIRC, after reading the instructions on how to compile and run the coupled models, have asked for example input files to test their implementation. This page provides an example application of Hurricane Gustav (2008), using files that were available already on the Internet for other applications. The entire set of example input files is: Gustav-EC95d.zip. Updated 2016/09/18: For versions before SWAN 41.10 and ADCIRC 53.00, please use these example input files: Gustav-EC95d-Old.zip. The individual files are also linked and described below. They have been modified to be compatible with the latest versions of the codes, and to reflect our latest settings for SWAN and ADCIRC. These files are extremely coarse, both in the mesh resolution and the wind field, but they are a good starting point for new users of the coupled models. For more information about our high-resolution hindcast of Gustav, please see our article in Monthly Weather Review. 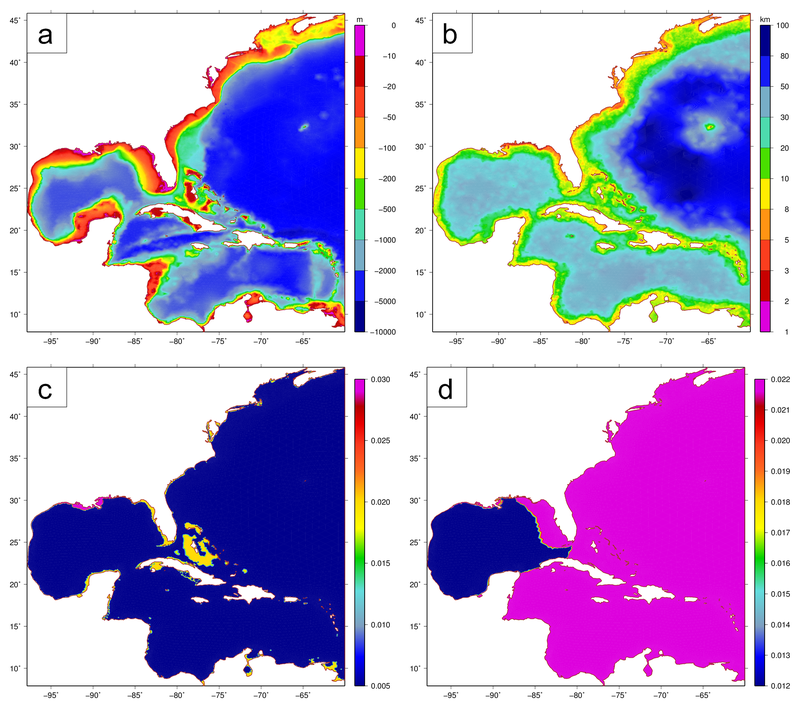 Figure 1: Panels of EC95d mesh (a) bathymetry (m) and (b) spacings (km), and vertex-based attributes of (c) primitive weighting in the GWCE and (d) Manning’s n values. The unstructured mesh is fort.14. The EC95d mesh contains 31,435 vertices and 58,369 triangular elements. It contains coverage of the entire Western North Atlantic Ocean, Caribbean Sea and Gulf of Mexico. It does not include any coastal floodplains (Figure 1a), and its coarse resolution ranges upward to element sizes of 100km (Figure 1b). This EC95d mesh has been available as an example problem on the ADCIRC Web site, specifically with an application to Hurricane Isabel, and has not been changed. First, the sea surface height above the geoid is set to a constant 0.22m; this setting reflects the 0.134m adjustment to the NAVD88 (2004.65) geoid in southern Louisiana, and the 0.086m adjustment for the steric expansion of the northern Gulf in early September. Second, the primitive weighting in the GWCE is set to a three-tiered scheme with values of 0.005 in deep water, 0.02 in shallow water, and 0.03 within southern Louisiana (Figure 1c). Third, the Manning’s n values are set to 0.012 on the muddy continental shelves near Louisiana and Texas, to 0.022 on the sandy Florida shelf and outside the Gulf, and to higher values in the nearshore (Figure 1d). All of these values have been interpolated from the high-resolution SL16 mesh that was employed in the Gustav hindcast described in the manuscript linked above. However, these settings may not be appropriate for storm surge simulations on the coarse EC95d mesh. They are included only as an example of the SWAN+ADCIRC capabilities. The control file is fort.15. This control file contains the run-time parameters for ADCIRC, including the time step, duration, output file specifications, etc. This Gustav simulation is set to run for a total of 11.5 days, including a 2-day ramp. This file also contains the tidal forcing along the open boundary in the Atlantic Ocean. These tidal amplitudes and phases were generated by using the tide_fac.f program from the ADCIRC Utility Programs Web page. This program requires a run duration (11.5 days) as well as a starting date/time, which was 2008/08/25/0000 UTC. The output of tidal amplitudes and phases is then copied manually into the control file. The wind file is bal072008.dat, which ADCIRC expects to be renamed as fort.22. ADCIRC accepts the best-track files from the NOAA FTP site, without modification, so long as the wind forcing is specified with a setting of NWS=8 in the ADCIRC control file. The best-track files contain information about the location of the eye, the central pressure, the radii to maximum winds, etc. ADCIRC uses this information to construct internally the pressure and wind fields. The Gustav file starts on 2008/08/25/0000 UTC, and so does our simulation. The control file is fort.26. SWAN also requires an initialization file called swaninit. The initialization file is read first by SWAN; for more information, please see the trouble-shooting page. Updated 2016/09/18: For versions before SWAN 41.10 and ADCIRC 53.00, please use this control file: fort.26-Old.zip. This control file contains the commands to couple winds, water levels, currents and bottom friction to ADCIRC. Many of these commands are described elsewhere on this site. Note that the ADCIRC Manning’s n values are converted to roughness lengths and passed to SWAN. Figure 2: Contours of significant wave heights (m) and vectors of wind velocities (m/s) in the Gulf of Mexico during Gustav. The hurricane track is shown with a black line. Because of the coarse resolution of the EC95d mesh, especially with respect to hurricane applications, this example problem is efficient. A simulation on the Henry2 system at NCSU used 32 cores and required about 95 minutes, or about 8 minutes per day of simulation. Computational performance will be a function of the system, however. The computed solution is reasonable. The significant wave heights are shown in Figure 2. Maximum wave heights of about 15m are observed near the eye of the storm in the Caribbean Sea, and about 10-12m in the Gulf. These wave propagate throughout the Gulf and dissipate on the continental shelf. This behavior is qualitatively similar to the results obtained in our high-resolution hindcast, linked above. The EC95d mesh does not resolve the floodplains of southern Louisiana, however, and thus the computed surge is not reliable. Figure 3 shows a comparison of the surge at NOAA stations 8761724, which is located on Grand Isle near the landfall of the storm. The maximum computed surge arrives several hours early and is too large by about 2m. The oscillations following the maximum surge are an indication that the flooding and recession processes are not being captured correctly. Despite the limited accuracy of this example problem, it is nonetheless a useful tool for testing the implementation of SWAN+ADCIRC. It shows how the input files can be established for a simulation with the coupled models, and it is small enough to be run quickly on a limited number of computational cores. Figure 3: Time series of water levels (m) at the NOAA station 8761724 near Grand Isle, LA. 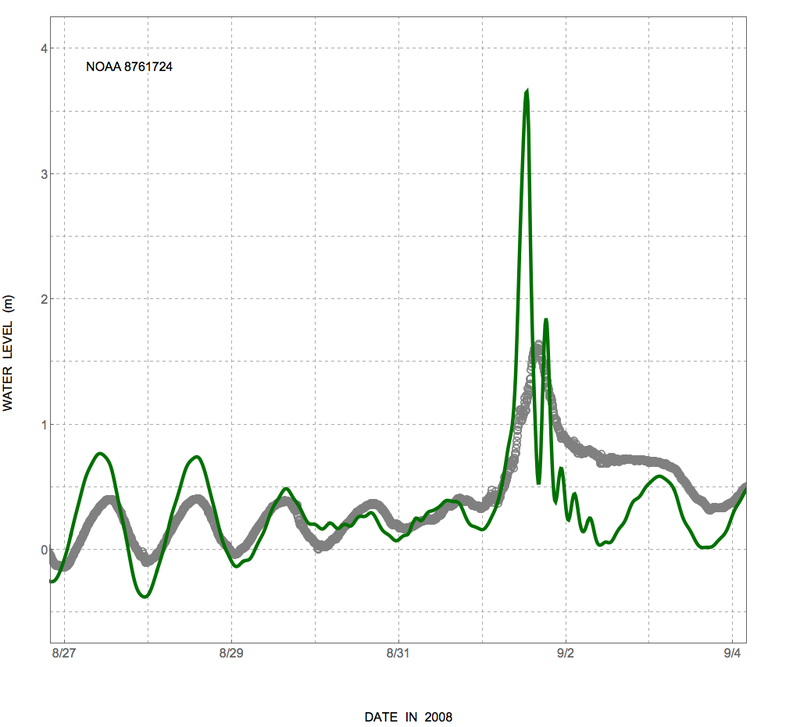 The measured data are shown with gray circles, while the ADCIRC-computed water levels are shown with a solid green line.